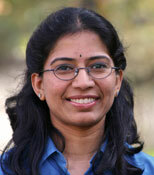 Vidya Guhan is a Speech Language Pathologist by profession. She graduated with honors from the University of Wisconsin at Madison where she studied under top researchers in the field and won many awards in both her undergraduate and graduate studies. For her Fellowship year of supervised practice she worked first with brain-injured children in a residential rehabilitation center, then with geriatric patients in a hospital setting. Then Vidya learned about the National Association for Child Development (NACD) and had Lavanya evaluated by Bob Doman. Vidya began NACD’s intensive, individualized home program with Lavanya, and within weeks saw remarkable, documented results. “The transition team had tested her, then the school tested her a month later. Within one month of starting the NACD program, Lavanya made a six-month jump in fine motor skills,” Vidya recalls. And the changes kept coming. “During her second quarter on the NACD program, we took Lavanya’s +5 prescription glasses off (which she hasn’t worn since) and got rid of her orthotics.” Vidya was so impressed she decided to become trained in NACD’s unique neurodevelopmental approach. She started working for NACD in California and eventually moved her family to Utah to work out of the home office and continue training under Bob Doman. Currently, Vidya conducts evaluations and provides parent support locally in Ogden, Utah, as well as in New Delhi, India. Vidya was instrumental in starting NACD’s first international chapter in India in the fall of 2005. She is also the project director for development of new NACD software. In between working for NACD and tending to her own family, Vidya makes time for her other passion, Indian classical dance. “Dancing is my way of relieving stress and maintaining spiritual balance,” Vidya says. Her daughter, Lavanya, continues on NACD program and has excelled in her development. Now ten years old, Lavanya is academically advanced for her age, testing at 6-7th grade level in reading and math. She homeschools and goes to mainstream fourth grade part time with her age appropriate peers. She is also part of the school chorus, and enjoys martial arts, piano, swimming and theater.